Just ask your local gypsy psychic: Predicting the future isn't easy. Particularly when you're committing your vision to celluloid for future generations to scrutinize. Some movies get it right. Bladerunner, for instance, looks like a documentary at this point and Gattaca's genetic manipulation is probably a few years away. But what makes the future look like the future? Fashion, primarily, with cars running a close second. When they present a future world, wise filmmakers don't go overboard. For example, Will Smith's Audi in I, Robot looks convincingly close to happening and Minority Report's sleek roadsters wouldn't look out of place at an auto show. But not everyone hits the mark. Some future movie cars are downright dumb. 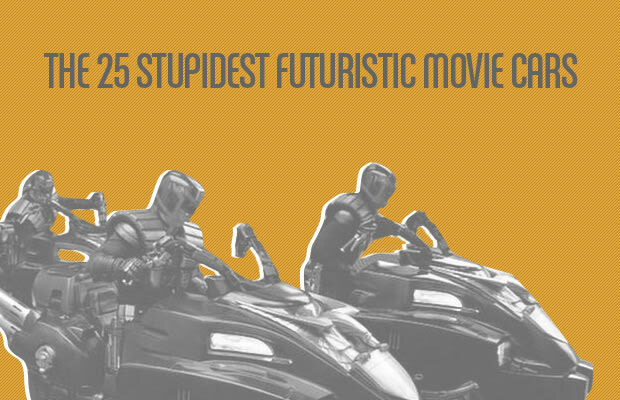 Here, we present the 25 stupidest.